The idea here is that one method can call another, which can call another, and so on. But no method can finish, and therefore be garbage collected from memory until the methods that it calls are finished. These unfinished methods are usually stacked up as they are called, with the most recent being on the top of the stack, and the initial (usually, ultimately the main method) being on the bottom of the stack. And usually the methods are attended to in a LIFO (Last in First Out) fashion. Here's an example of how I might be interrupted by calls to my attention in class. "So, I'll get back to taking about loops after I mention something quickly about..."
(There's a knock at the door.) "Just a minute, I'll see who's at the door". (Just then, my mobile phone goes off.) "Woops... it's my my phone; I had better answer it; I'll be right with you." "Yes, this is John Rayworth. Yes, I subscribe to O2..." (Then my desk phone starts to ring.) "Just one minute... my other phone is ringing." "Oh, hello, Veronika, yes, Adam is here. Ok, I'll get him to go sign in." So at this point there is a stack of five things I'm in the process of doing. I'll finish them one at a time, starting with the last one "in" on the stack. Ok, bye. Have a good day, Veronika. (Back to the mobile phone.) Sorry, what were you saying? No, no, thanks; I like my service the way it is. Good bye..
(Back to the visitor at the door.) Would you just like to print? That's ok; go ahead. 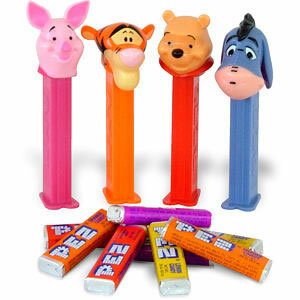 They get "popped" off the top of the stack (just like a PEZ candy - see image below) one at a time as they are completed, starting with method3 and working down to main.